Skala is one of the most popular and well-organised resorts on the southernmost part of the island of Kefalonia. It is 35 kilometres away from Argostoli and just like the neighbouring village of Katelios is a paradise for walkers and nature lovers. The most distinguishing feature of Skala is its very long shingly and sandy beach with the forest of pine trees at the back of it, separating the land from the sea. Because of the popularity of the resort, the beach gets quite busy during the high season, despite its large size. However, if you love doing water sports, then this beach is the right one for you, as there is an organised water sports school here. If you like having fun on the beach and enjoying some music while lying on sun loungers, you could definitely go to some of the lively beach bars of Skala. For those of you who want to avoid the noise of a busy beach, there are still a lot of beautiful spots for some privacy and relaxation in the small, secluded coves of the area around the resort. You could also go on a daily boat trip to Poros or other areas of the beautiful island of Kefalonia by joining one of the cruises organised from Skala. In the village, there are a lot of taverns, restaurants, bars and supermarkets to accommodate all your basic needs. From having a delicious lunch in a Greek-style taverna and a refreshing cocktail in one of the local bars to buying everyday supplies from the supermarkets and Greek souvenirs from the gift shops, Skala has it all. If you decide to eat in one of the taverns in the village, go for a traditional dish called “bianco”. It’s a delicious fish stew with garlic flavour, served with crusty bread. Everything is within a reasonable distance and therefore you won’t have to waste time by travelling to bigger towns, like Argostoli. However, if you don’t mind moving around, we suggest you have dinner in one of the notable fish taverns of nearby Katelios. Accommodation is also more than satisfying since there are luxurious 4-star and 3-star hotels as well as more affordable apartments and villas. Book a room in Skala to enjoy the warm hospitality of the locals and learn more for the rich Kefalonian culture from your friendly hosts. For your fun time at night, apart from the bars and taverns which are almost a must-visit place wherever you are on Kefalonia, there is also a local club if you want to dance the night away. For more options, you could go to Argostoli to experience a vivid nightlife. 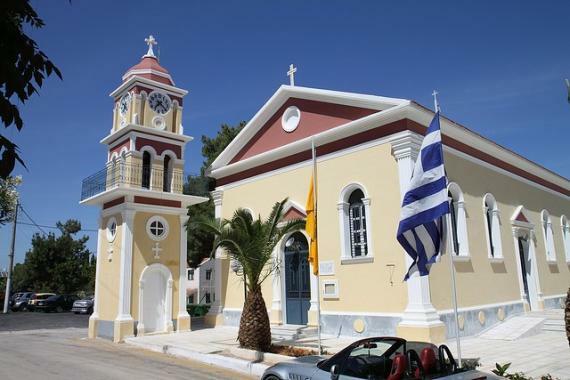 If you want to do more than beach holidays and are interested in going sightseeing, in Skala there are both natural and historic sites, such as the Cave of Sakkos, the temple of Apollo, the ruins of the old town and the chapel of Agios Georgios. In the Cave of Sakkos, findings from the prehistoric period were discovered, while the ruins of the temple of Apollo, outside Skala, along the coastal road to Poros, date back to 6th century BC with its remarkable Doric columns still standing. The chapel of Agios Georgios was rebuilt after the devastating earthquake of 1953 using some of the ruins of the temple of Apollo. Find information about selected Hotels, apartments and rooms in Skala to choose the perfect place for your accommodation.